Q: Which of your red IRON OXIDE pigments would lend itself best to mixing glowing pinks and peaches? I know they are all of good quality, but one must stand out as best for clean pinks and peaches. Or perhaps one of the natural earths would be better suited? A: Without doing extensive testing, we would estimate that the Iron Oxide Red Light would turn pink with white, while the Iron Oxide Red Medium would be more of a peachy shade when blended with white. Both of these colors would generate very bright and synthetic looking shades. 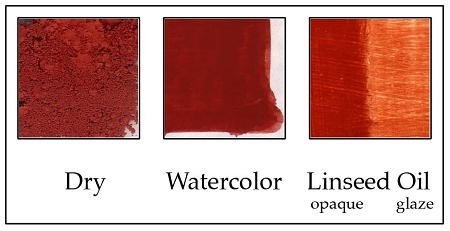 Such natural pigments as Burnt Sienna or Venetian Red would yield more natural looking shades. Q: What is the highest chroma Earth, or oxide, red you carry? Same question in regard to your yellow ochres and siennas. Thanks. R PS-Is there a forum on your site where general paint making questions may be asked that don't pertain to a specific product? A: All of our natural earth pigments rival the brilliance of manufactured iron oxide pigments. This is due to the fact that all of our natural earth pigments have a higher concentration of naturally occurring iron oxide, than most other earth pigments. We have found that using our on-line catalog is the best forum to answer questions. What better place to find answers, than right where the product is available?